On March 13 I flew into Guatemala City. I was picked up from the airport and driven to Antigua. Our guide told us that Antigua, a town of about 6 square blocks, is one of those special locations chosen by UNESCO as a World Heritage Site. 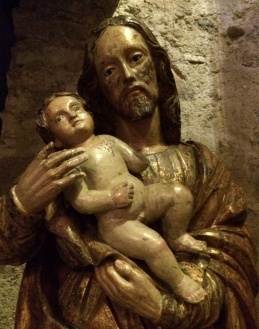 When I walked into one of the museums, I saw a statue of Jesus holding a baby. The look on Jesus’ face was so movingly tender and compassionate as he held the baby. I was mesmerized by the wooden replica that touched my soul so deeply. My need for this kind of compassionate holding didn’t get filled completely when I was a little one. Was it the same for you? I’m talking about the sense of relaxing into a greater holding. No worries or anxiety. Resting in the arms of God, the divine, being, or however you prefer to name it. Relaxing with an open heart and mind. It’s all okay, because we’re held in compassion – the enduring compassionate holding that I felt from Jesus’ face that day. Instead we often get caught up in efforting to hold ourselves and others up. Sometimes carrying the weight of the world on our shoulders. Being so responsible – for so much. It’s exhausting. And when I’m carrying the weight of the world on my shoulders, I’m not so available to give or receive compassion, that sweet healer. My heart is contracted by the fear of what if things don’t work out. And making them work out is up to me. Are you familiar with that thought process? Later that evening after my experience with the statue of Jesus holding the baby, I laid down on my bed in my Guatemalan hotel room. I visualized myself being that babe held in Jesus’ arms. Resting in the compassionate divine. Are there times when you’re stressed or fretting that you would appreciate resting in the compassionate embrace of the divine?